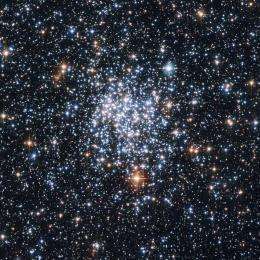 (PhysOrg.com) -- Not all stars are loners. In our home galaxy, the Milky Way, about half of all stars have a companion and travel through space in a binary system. But explaining why some stars are in double or even triple systems while others are single has been something of a mystery. Now a team of astronomers from Bonn University and the Max-Planck-Institute for Radio astronomy (also in Bonn) think they have the answer  different stellar birth environments decide whether a star holds on to its companion. The scientists publish their results in a paper in the journal Monthly Notices of the Royal Astronomical Society. Stars generally do not form in isolation but are born together in groups within clouds of gas and dust or nebulae. These stellar labour rooms produce binary star systems, which means that virtually all newborn stars have a companion. Most of these groups of stars disperse quickly so that their members become part of the Galaxy. But why, then, are not all stars seen in the sky binaries, but only half of them? Before the groups of stars disperse, binary stars move through their birth sites and the group studied how they interact with other stars gravitationally. "In many cases the pairs are torn apart into two single stars, in the same way that a pair of dancers might be separated after colliding with another couple on a crowded dance floor", explains Michael Marks, a PhD student and member of the International Max-Planck Research School for Astronomy and Astrophysics. The population of binaries is therefore diminished before the stars spread out into the wider Galaxy. The stellar nurseries do not all look the same and are crowded to different extents, something described by the density of the group. The more binaries form within the same space (higher density groups), the more interaction will take place between them and the more binary systems will be split up into single stars. This means that every group has a different composition of single and binary stars when the group disperses, depending on the initial density of stars. By using computer models to calculate the resulting composition of stars and binaries in regions of different densities, the Bonn astronomers know how different types of birth sites will contribute single stars and binary systems to the wider Galaxy. "Working out the composition of the Milky Way from these numbers is simple: We just add up the single and binary stars in all the dispersed groups to build a population for the wider Galaxy", says Kroupa. Marks explains how this new approach can be used much more widely: "This is the first time we have been able to compute the stellar content of a whole galaxy, something that was simply not possible until now. With our new method we can now calculate the stellar contents of many different galaxies and work out how many single and binary stars they have."